Address: 135 North 5th St.
“A taste of Paris in Brooklyn.” Juliette offers a fine French brunch in an environment reminiscent of a Paris bistro. I started with the roasted banana stuffed French toast. The middle of the thick French toast was dotted with banana chunks. The dish was accented with small slices of banana, maply syrup, whipped cream, and plenty of caramelized walnuts. Each bite packs at least one banana slice. For anyone with a sweet tooth, this is the dish you want. 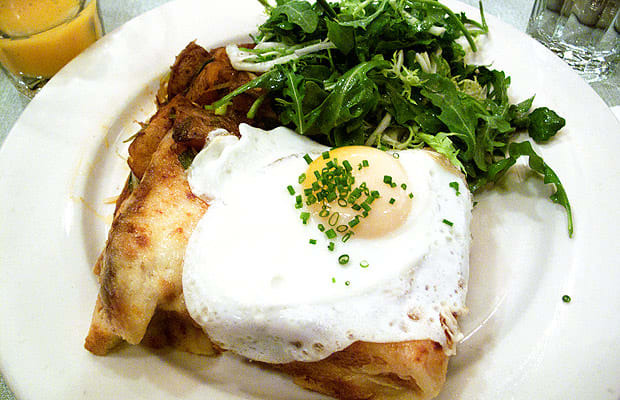 The tartine croque madame with egg is what I go to Juliette to devour. It includes ham and Swiss cheese on a homemade brioche, with red bliss home fries and a side of salad. The ham is sweet, the brioche is fluffy, and the cheese is subtle. The potatoes are golden brown with a crispy outer crust. The greens are fresh, with a light vinaigrette dressing. Located next to Egg, some say Juliette is Plan B but if you want a bona fide French brunch this is Plan A, B, and C.